Well, along with all the books I am looking forward to in 2011, there are a also a few films that I can't wait to see. 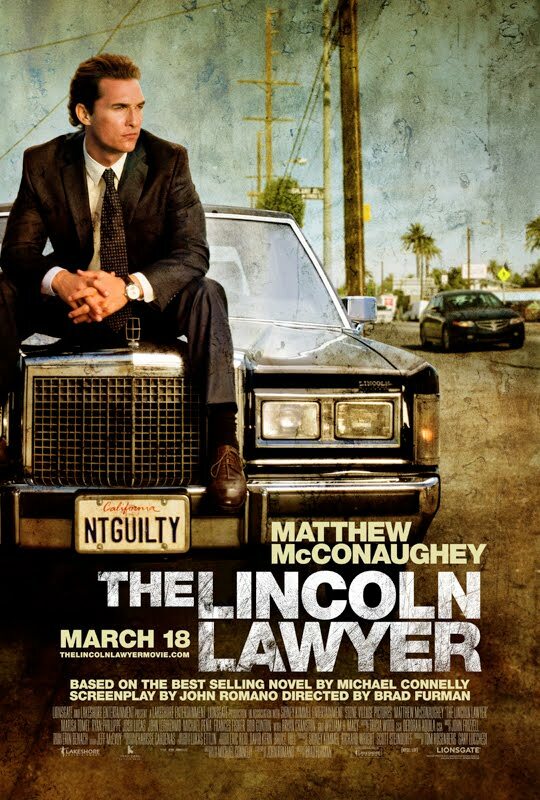 And perhaps the one I am most excited about is THE LINCOLN LAWYER, based on the superb Michael Connelly book of the same name. And it seems I'm not the only one - film critics are already starting to list it on must-see or most promising movies of 2011 lists. Although book-to-film adaptations don't always go well, and can fall very flat at times, I am hopeful about this film for a number of reasons, including the trailer, the stellar cast, and the fact that when I interviewed him late last year Connelly himself seemed very happy with the script adaptation, and how it was looking (having been on set). So fingers crossed THE LINCOLN LAWYER delivers. You can watch the first trailer here, and also read some comments from Connelly to me about the movie. You can read my NZ Herald article on Connelly here, and his 9mm interview here. Are you looking forward to THE LINCOLN LAWYER? Have you read the book? What crime novels would you most like to see turned into films? I'm waiting for the film versions of Peter Robinson's Alan Banks mysteries. I think BBC is doing a TV adaption of it. I hope that one or more Eliot Pattison's Tibetan mysteries get dramatized, but I'm not too hopeful about these. I've read several of Connelly's "Harry Bosch" novels, and one which, I think, featured both Bosch and the lawyer. It was long ago, so I'm not sure about this. THE BRASS VERDICT and THE REVERSAL both have Bosch and Haller in (the last one in particular features them both almost evenly). The BBC has done an adaption. I believe the first one was called DCI Banks: Aftermath, and miight have shown on British TV late last year. Stephen Tompkinson from Wild at Heart fame stars as Banks. I had heard that one of Robinson's had been dramatized but not which one. I immediately checked, and so far Netflix hasn't picked it up yet. Who writes the DI Tom Thorne series? I think I read one once long ago, but the author's name escapes me. Hey Fred - the DI Tom Thorne series is written by Mark Billingham. For my mind, one of the very best British cop series of novels in the past few years. Thanks for the information. I've seen his name around, but I've never read anything by Billingham. I'll add him to my list. I really enjoyed his performance in FRAILTY, a nice little smaller-budget thriller directed by Bill Paxton (who also starred).